A cushion cut diamond, with its gently rounded corners and sparkling beauty, makes an elegant choice for any ring. Whether you're shopping for an engagement ring, wedding band, or other bauble, you've got a lot of lovely options. Click on "Buy Now," to see purchasing information for any ring. A simple solitaire design makes a beautiful statement, especially when it boasts a beautiful cushion-cut gem. This elegant ring features a cushion-cut diamond that's prong-set atop a simple 14k rose gold band. You can choose from .25 carats to 1 carat and the price ranges from around $500 to just under $4,000. A three-stone ring makes a meaningful choice for an anniversary or engagement ring, often symbolizing the past, present, and future of a couple's life together. This pretty 14k yellow gold ring features a .75-carat, cushion-cut center diamond flanked by two smaller round diamonds for a total weight of two carats. It retails for about $5,300. A beautiful, cushion-cut diamond can display outstanding sparkle and fire, especially when the light is reflected by surrounding gems. In this exquisite, platinum ring, a .74-carat, cushion cut diamond is flanked by two, half-bezel-set baguettes. This amazing ring retails for about $3,200. Pave-set diamonds add exceptional sparkle to a cushion cut ring. In this pretty design, the band features pave set round diamonds that enhance the spectacular beauty of the .5-carat, cushion-cut center diamond. Making this ring stand out even more is the baguette and round diamond halo. This ring features 1.3 total carats of sparkling diamonds. The modern design retails for around $3,000. This lovely design features a .7-carat cushion-cut center set atop an eternity style band with a twisting shank. The effect is romantic and whimsical. The 14k white gold setting offers a glowing backdrop for the sparkling gems. This ring retails for about $3,000. Princess accents and a channel set diamond band add sparkle and modern style to a center cushion-cut gem. In this design, a cushion-cut diamond takes center stage. It's flanked by a row of channel-set, round-cut diamonds on each side, and it's further accented by two sparkling, princess-cut diamonds. This 14k white gold ring has a total weight of 2.36 carats and retails for about $8,500. An eternity band makes a great choice for a wedding ring or anniversary ring, and it has a lovely, soft look when it features cushion-cut diamonds. In this exquisite design, beautiful cushion-cut diamonds adorn a simple 14k white gold band, giving the ring a total weight of 2.6 carats. It retails for about $4,000. This gorgeous 1.45 carat cushion-cut diamond is set in a halo of white gold set off by milgrain detailing. In this spectacular design the band and setting feature small, round diamonds, giving this a modern feel. The white gold setting adds even more feminine beauty to this ring, which retails for about $5,000. Cushion-cut diamonds also look amazing in fancy colors, such as a yellow diamond ring. This beautiful ring features a fancy yellow diamond surrounded by a halo white diamonds (4.2 total carat weight), pave set in platinum. It retails for about $38,000. No matter which design you choose, you'll love the softly rounded corners and unbeatable sparkle of a cushion-cut center diamond. 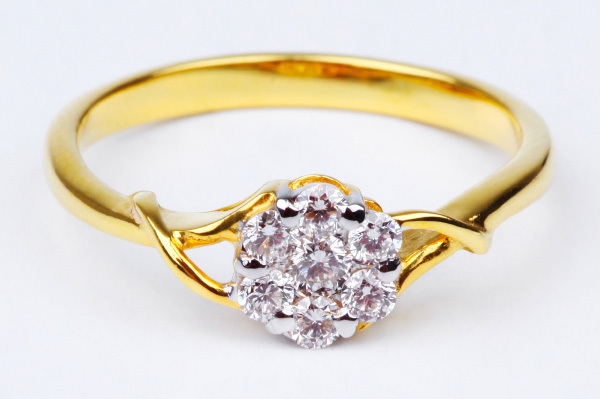 This exquisite stone will sparkle in any style of ring.